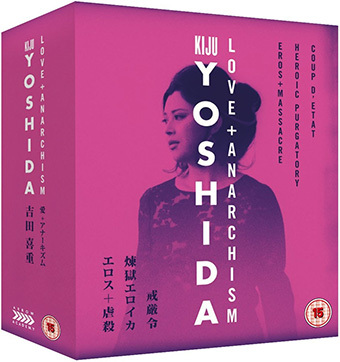 This year’s Il Cinema Ritrovato DVD Awards presents three finalists from the Arrow Academy: The Rainer Werner Fassbinder Collection, The Jacques Rivette Collection, Kiju Yoshida: Love + Anarchism. 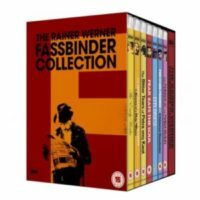 The Rainer Werner Fassbinder Collection (Germany, 1966-1979) is a limited edition blu-ray box set which includes some of the best films made by Rainer Werner Fassbinder, who, together with other great directors such as Werner Herzog and Wim Wenders, brought the New German Cinema to the great public. The Blu-rays included in the box set are seven. The first one is dedicated to one of the oldest works of the German director and it comprises, along with a documentary about his very first days as a director, everything that has survived among his films shot during the 60s: Der Stadtstreicher (1966), Das kleine Chaos (1966), Love Is Colder Than Death (1969), Katzelmacher (1969). Other films contained in the box set are Beware of a Holy Whore (1971), The Merchant of Four Seasons (1972), The Bitter Tears of Petra von Kant (1972), Ali: Fear Eats the Soul (1974), Effi Briest (1974), Fox and His Friends (1975), Chinese Roulette (1976), The Marriage of Maria Braun (1979). Each one of these films is presented in a restored 4K version from the original camera of the Rainer Werner Fassbinder Foundation. Furthermore, the box set includes a large selection of extra contents, among which are documentaries, interviews and focuses as well as a 200 page booklet with films’ data sheets, photographies and some original essays. 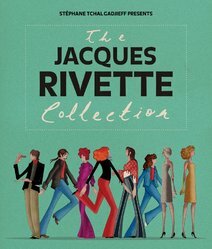 The Jacques Rivette Collection contains the restored version, both in DVD and in Blu-ray, also available on Home Video to the English market, some of the rarest films by the French director. Out 1 (1971), almost 13 hours divided in 8 episodes based on Honoré de Balzac’s Histoire des treize, is released in two restored version: the full-length original series and the four and a half hour-long version Out1: Spectre. The collection also includes Duelle (une quarantaine) and Noroît (une vengeance), both produced in 1976 as chapters of an imaginary quadrilogy completed by Celine and Julie Go Boating (1974) and The Story of Marie and Julien (2003), and Merry-Go-Round (1981), with Joe Dallesandro and Maria Schneider. The box set is completed with the documentary The Mysteries of Paris: Jacques Rivette’s Out 1 Revisited, including interviews with cast members, a series of interviews where Rivette talks about Duelle (une quarantaine), Noroît (une vengeance) and Merry-Go-Round, an unpublished interview with the film critic Jonathan Rosenbaum and a 200 page booklet containing unpublished essays and stills from the films. The box set Kiju Yoshida: Love + Anarchism contains a dual-format edition, in DVD and Blu-ray, of three from the most radical films by Kiju Yoshida, one of the biggest representatives of the Japanese Nouvelle Vague, the Shochiku Nuberu Bagu. Eros + Massacre (1969), biography of the anarchic Sakae Ōsugi, is released both in the theatrical version (169 minutes) and in the full-lenght version with director’s cut (220 minutes). 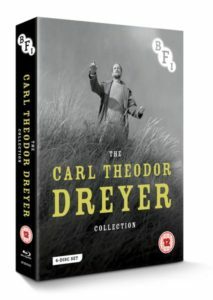 The box set also contains the other two films in the trilogy: Heroic Purgatory (1970) and Coup d’état (1973). Among the extras are the documentary Yoshida…or: The Explosion of the Story, on Eros + Massacre, the introduction of the director to Heroic Purgatory and Coup d’état, many focuses on the trilogy and an 80 page booklet with original essays and photographies. 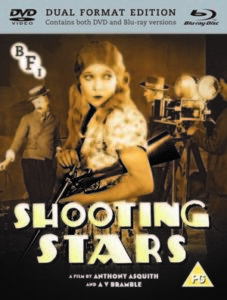 Among the latest BFI film releases two finalists have been selected for this year’s Il Cinema Ritrovato DVD Awards: the DVD and Blu-ray edition of Shooting Stars (1928) by Anthony Asquith, newly restored by the BFI National Archive, with the original film score by John Altman. The DVD, which completes the restoration project of the English director promoted by the BFI, contains many extras on the Studios during that era (also main subject of the film), a photo gallery, the original subject, a booklet with illustrations with unpublished essays written by the curator Bryony Dixon and others. The Carl Theodor Dreyer Collection is a limited Blu-ray edition containing, in the newly remastered version, some of the most famous films of Carl Theodor Dreyer, such as The Super (1925), Day of Wrath (1943), Ordet (1955) and Gertrud (1964), but also less known works and short-films such as Mødrehjælpen (1942), De nåede färgen (1948), Thorvalsden (1949), The Storstrom Bridge (1950), A Castle in Italy (1954). Among the many extras: a 4 minute video of the film restoration process on The Super, interviews and focuses on films, rare documents from the archive, a 40 page booklet. From the independent Spanish film distributor Cameo comes Del trazo al píxel_ Un recorrido por la animación española: 3 DVDs with 51 short films (from 1909 to nowadays), Historias de amor y masacre (1979, the first Spanish feature film for adults in the restored version), a 30 minute spot of the Estudios Moro, a long adventure across the best Spanish animated films. This edition also contains interviews with the directors and a 160 page booklet with historical focuses and film’s data sheets. Blaq Out presents, for the first time in France, the entire filmography of Frederick Wiseman, one of the most talented documentarists in Cinema history. 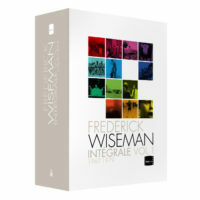 Frederick Wiseman Intégrale vol.1 is the first of three volumes and it includes the first 13 films of the north-american director, produced between 1967 and 1979. Showing images shot in various institutes, a high school (High School, 1968), an emergency room (Hospital, 1970), a benedictine monastery (Essene, 1972), a research center on primates (Primate, 1974), military academies (Basic Training, 1971 and Canal Zone, 1977), the director shows a “critical portrait” of the contemporary US society. The box set includes a 100 page booklet with unpublished critical texts, analysis of the films and an interview with the director. 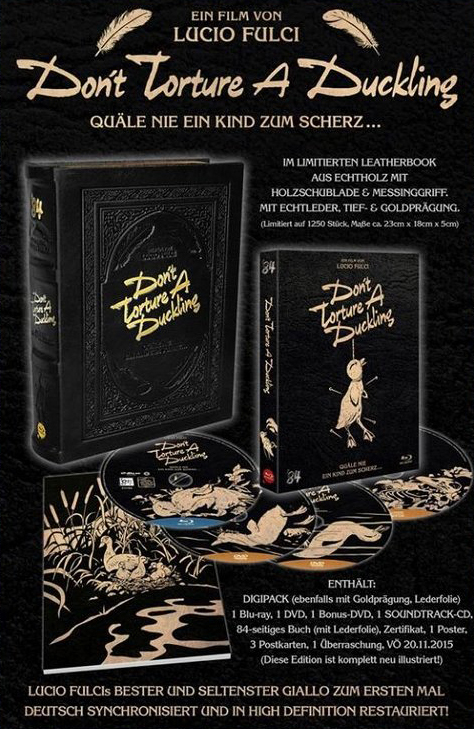 ’84 Entertainment, a German distribution company specialised in horror films, presents the restored edition of Don’t Torture a Duckling (1972), cult film by Lucio Fulci. A rich limited edition box set made out of wood and leather, both in DVD and Blu-ray, with the interview with the director of photography Sergio D’Offizi and the editor Bruno Micheli, original trailers and a focus on the restoration. A CD with the original score, a poster, cards from the film, some gadgets and a booklet are included.